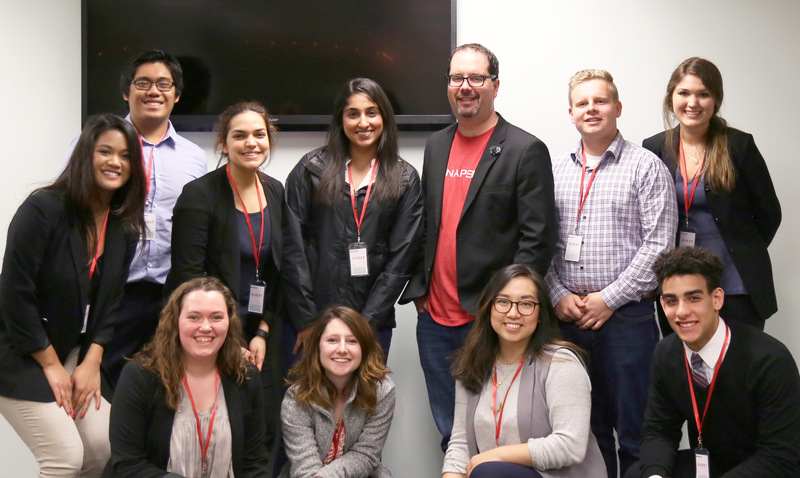 A few months ago the Seattle Synapse office was contacted by the University of Washington Business Fraternity, Phi Chi Theta, hoping to coordinate an office tour and info session with the Synapse senior leadership team. Similar to Synapse, Phi Chi Theta is a small organization that feels like family, and each member wears many hats to make it successful. Each student brings a unique perspective to the group, reflective of their wide variety of educational backgrounds: engineering, marketing, journalism, business, and finance. Even though many of the students were in the midst of midterms, twelve students hopped on a bus and headed to the Synapse office in downtown Seattle. Synapse gladly welcomed the students and organized some time for our Vice President of Finance, Jon Lyons, to answer general questions and speak with the group on finance, accounting, and employee recruitment. The students were curious about Jon’s background and time at Synapse, and came ready and eager to ask well thought out questions. They are a very motivated bunch that were keen on gaining advice on their steps after graduation. One of the engineers in the audience already knew he wants to work for Synapse! They inquired about the Synapse internship program and enjoyed hearing about the hands-on experience interns receive with client projects. The Synapse team loves to open our office doors to student groups, but especially to groups as engaged as this one. Please contact us if your group would like to stop by our offices!